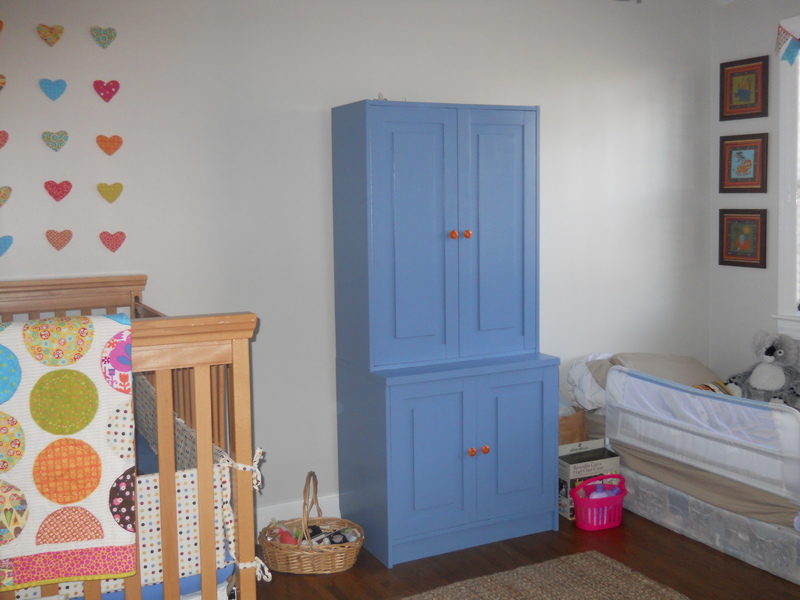 My last project for the nursery is done, ladies and gentlemen! This was a simple little thing that anyone could do. 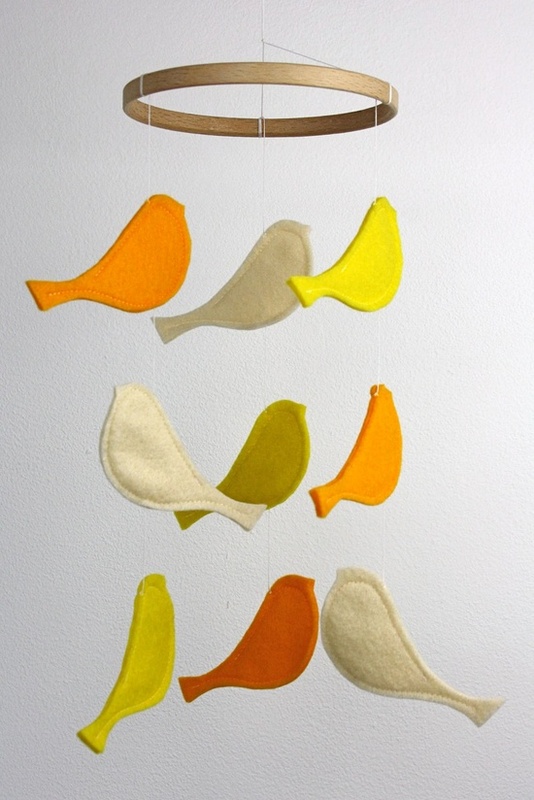 It would make a really sweet baby shower gift, too! My inspiration came from something I saw online. I thought it was adorable and knew I wanted to incorporate something similar into my plans. All I needed was an 11×13 frame with matting (that I found at Goodwill for $2), a can of white spray paint, fabric scraps from the baby quilt and heart wall hanging, a glue stick to attach the fabric to the matting, and some simple paper to print out my creation. The hubs and I designed the layout and he picked out the font (American Typewriter) which I absolutely love! Then, all we had to do was print and assemble. 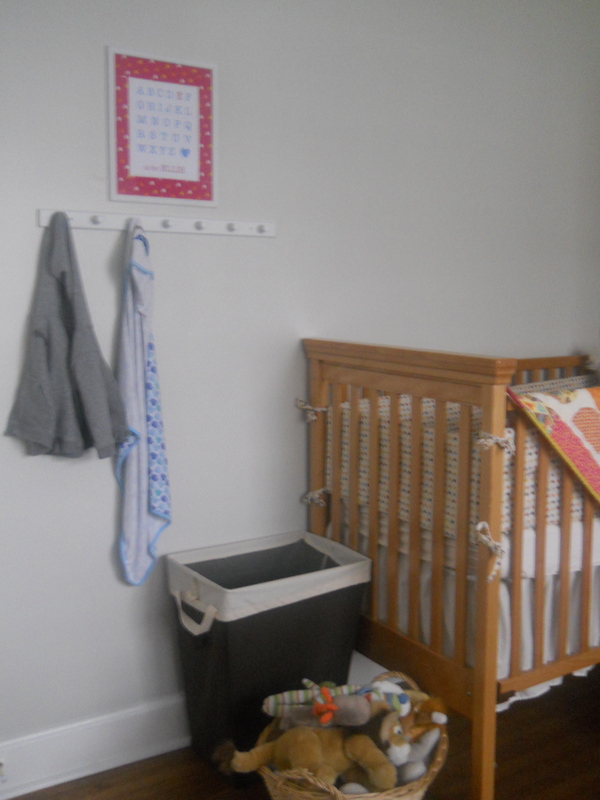 We hung it above the peg coat rack (something we already had and just repainted to match the frame) next to the crib. 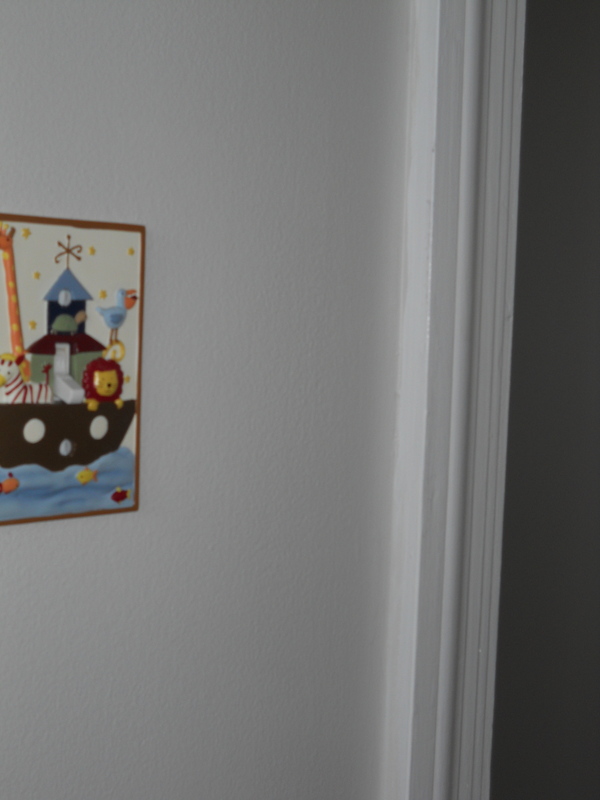 On the other side, we hung the sweet painting Aunt Merrill made for Liam’s nursery. 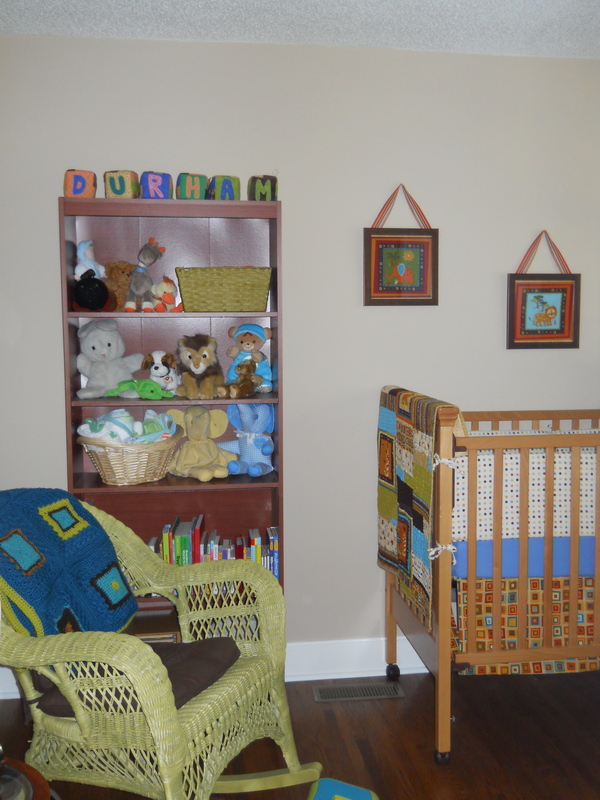 With each piece that goes on the wall, the room feels warmer and more complete. I am loving it. As I’ve mentioned before, this room for two doesn’t have much space, so I really have to think through every thing that makes it in there. 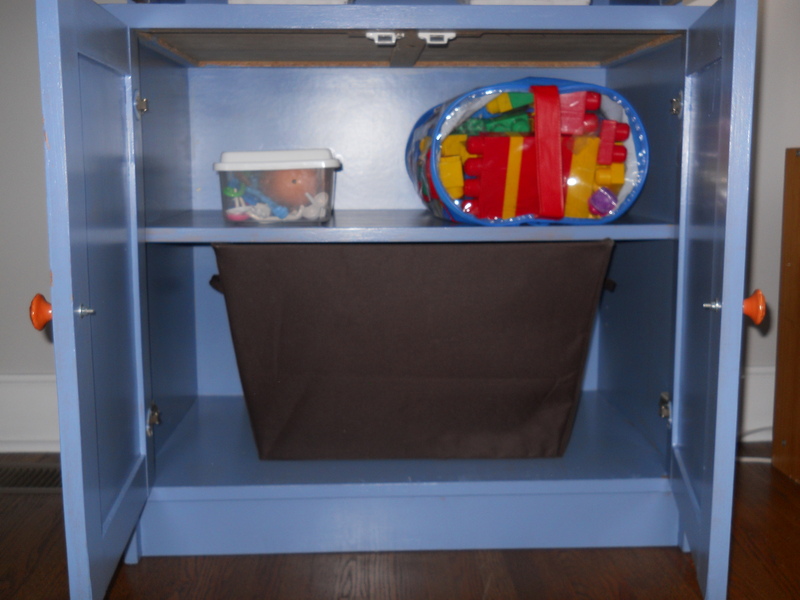 Today is a continuation of Phase Four by bringing in more color AND storage. 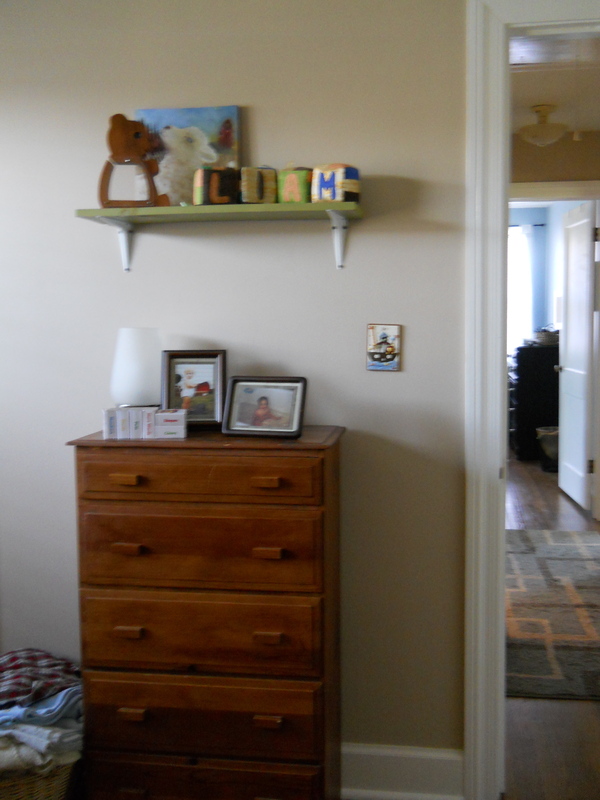 Without further ado, here are the shelves we installed to make room for special gifts Liam has received, some of our own childhood mementos, pictures, etc. They came from a tall, thin set of shelves, also from my in-laws’ kitchen (are you noticing a pattern?) 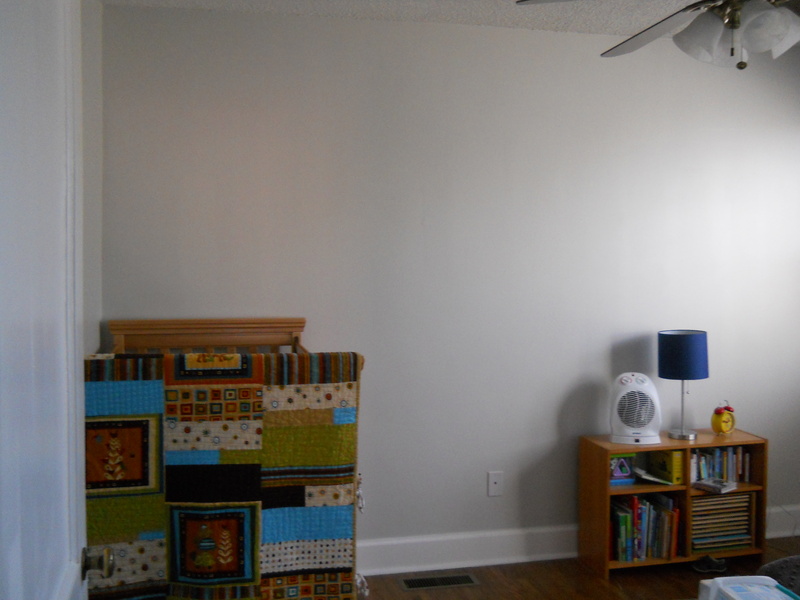 that we cut in half and painted white to better fit the space in the room. 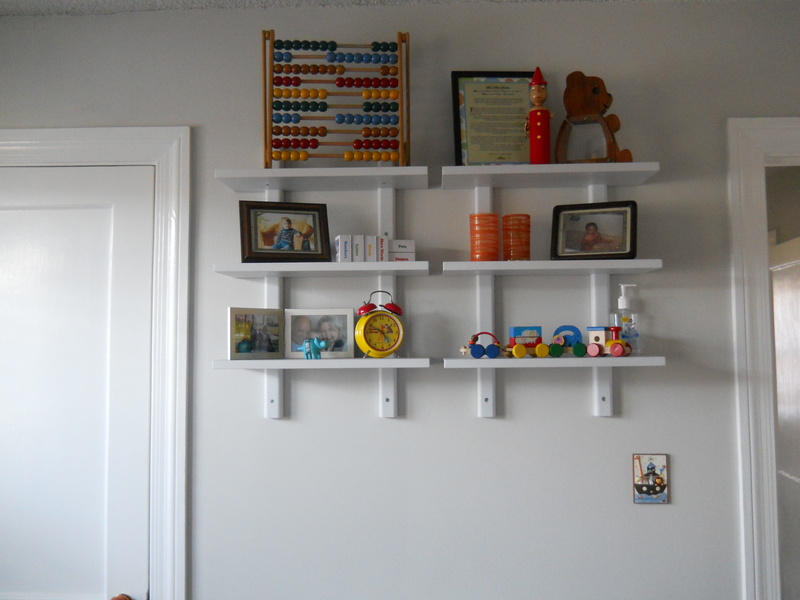 These happy shelves sit above our “new” changing table (a Craigslist find that I intended to refinish and paint, but whose brass and worn charm grew on me). 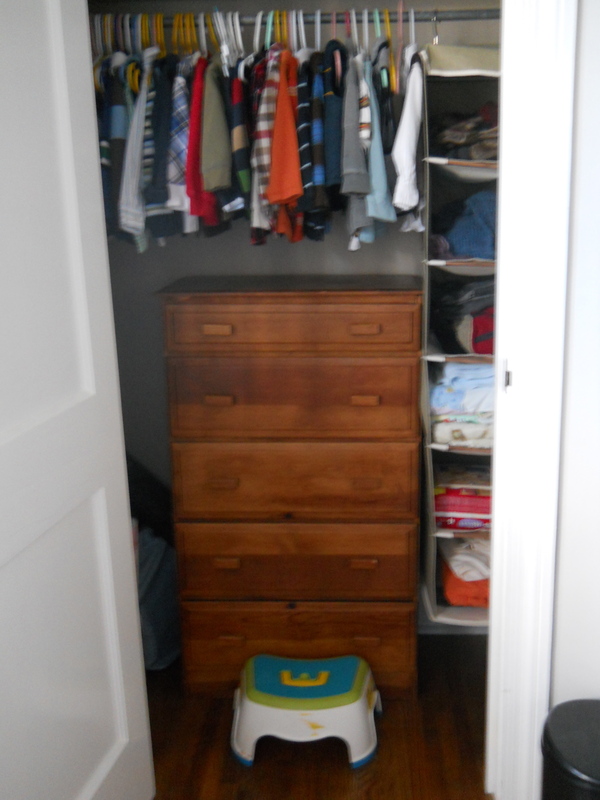 And, for practicality’s sake alone, the room’s previous dresser (one of my childhood dressers) moved into Liam’s closet. 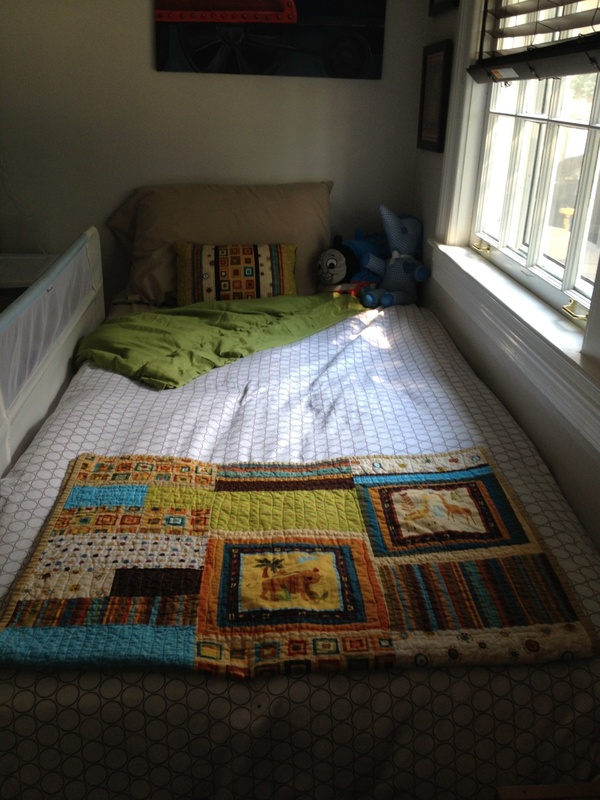 A shot of Liam’s “big bed” that we are hoping to transition him to on his second birthday next month. 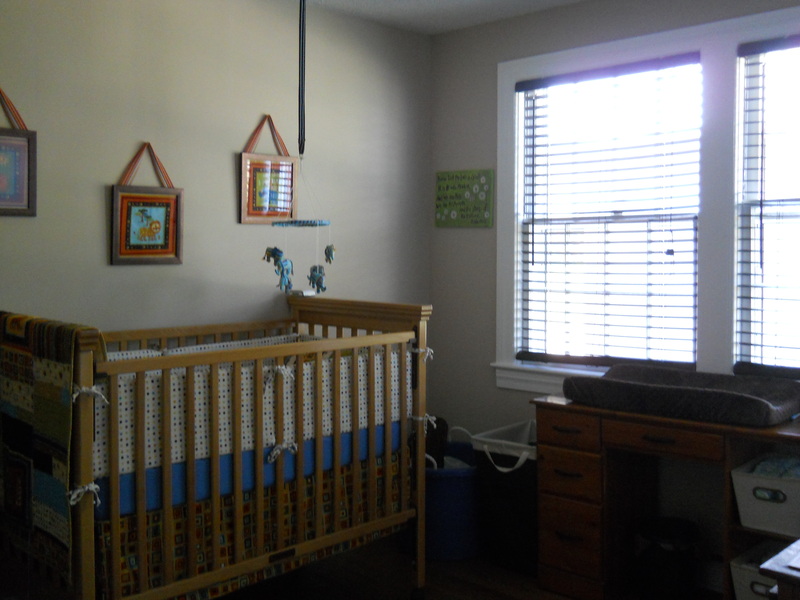 Here’s Liam’s handmade elephant mobile hanging in the corner. Excuse the poor lighting…my camera and I really aren’t good friends. 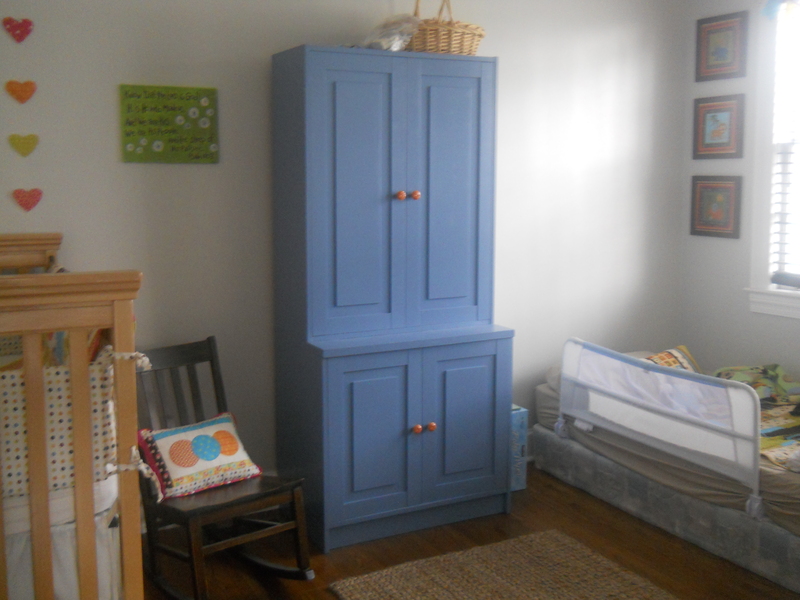 Well, it’s on to Phase Four of the nursery makeover! (i.e. 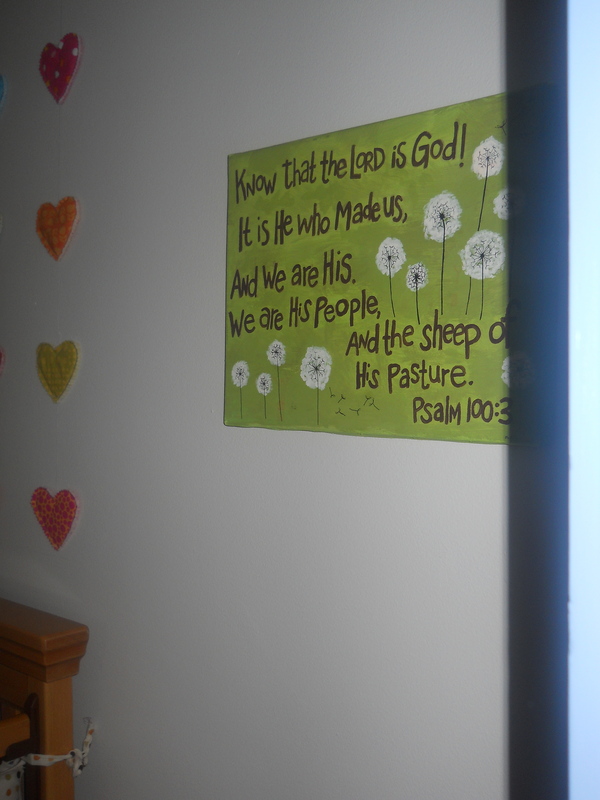 getting some color on the walls) The kids’ room is finally shaping up with a few additions of sewing projects! 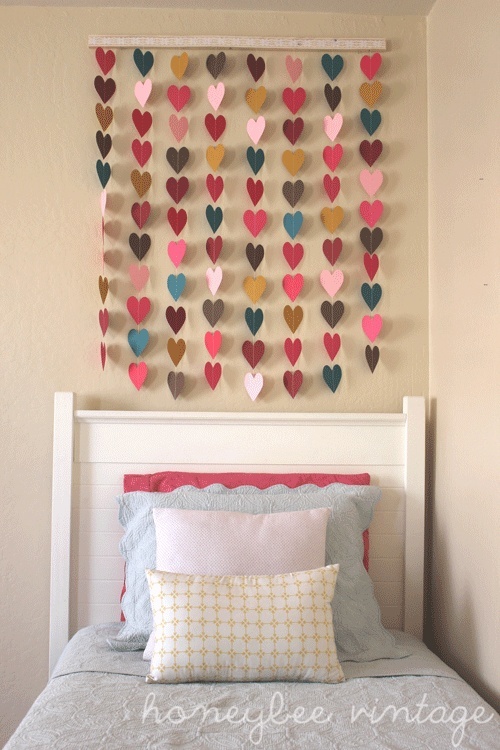 I knew I wanted the heart pattern, and then I decided that something on the wall rather than a hanging mobile would add more pop to my neutral walls. 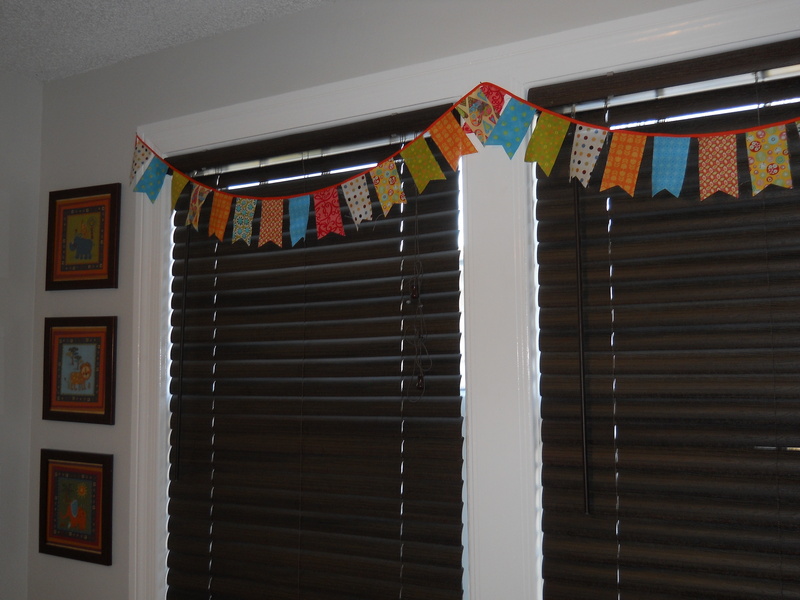 In talking with my mom, she suggested something more 3 dimensional and made of fabric instead of plain paper. Her suggestion was fabric with batting in between. My sweet sister-in-law came over and we got to work! I cut out a template from a piece of paper and then we traced it on the fabric. 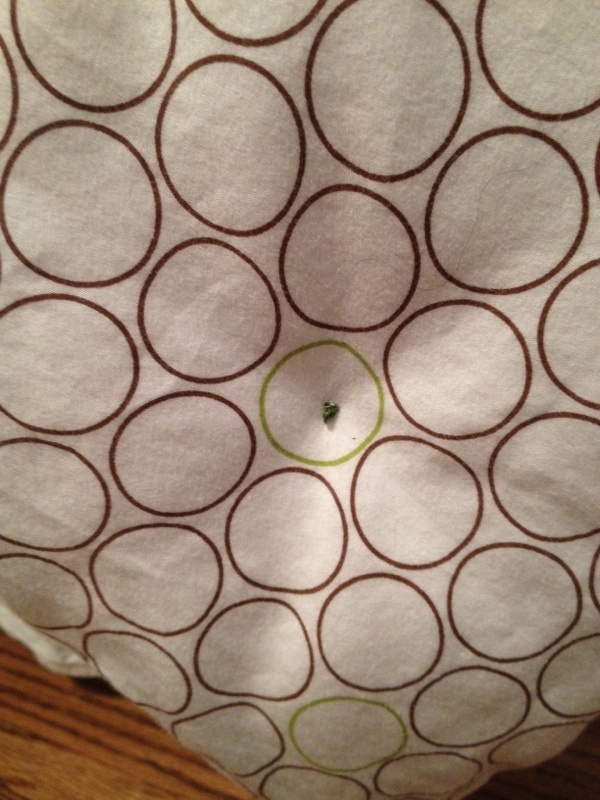 Next, we ironed the batting in between two scraps of fabric. I sewed around the traced heart and cut out the heart shape with pinking shears (so it wouldn’t fray). 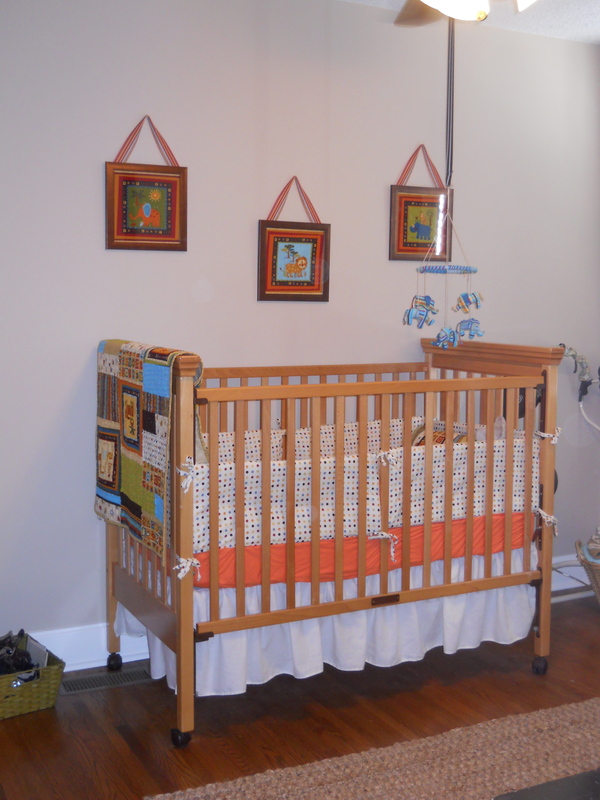 I bought a wooden trim at Michael’s and cut it down to the width of the crib. 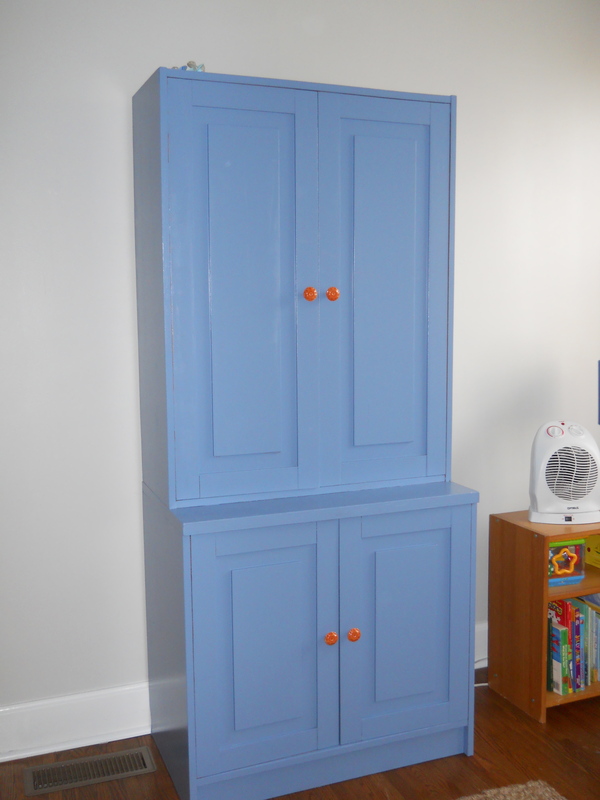 We painted that with the same blue paint as the armoire. 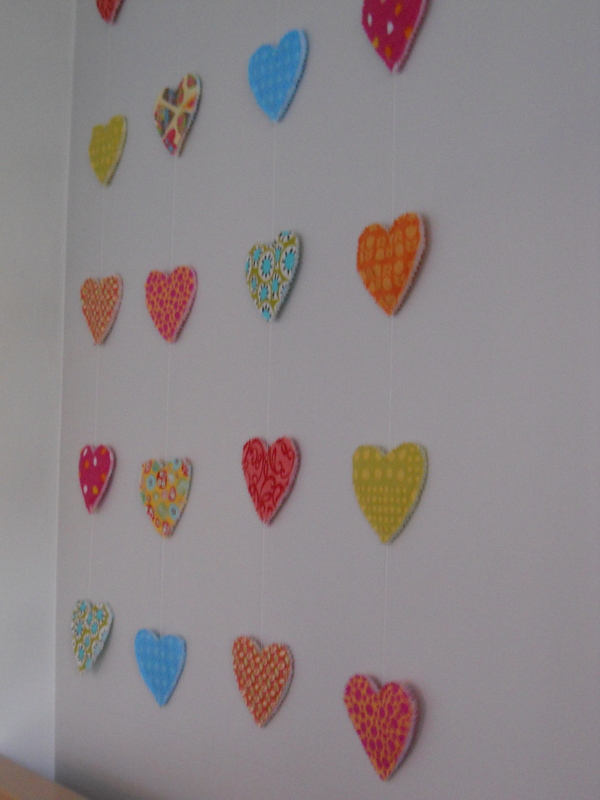 Now, I needed to attach the hearts and trim together so it could hang. I bought some nylon thread, but regular sewing thread would’ve worked well in hindsight. 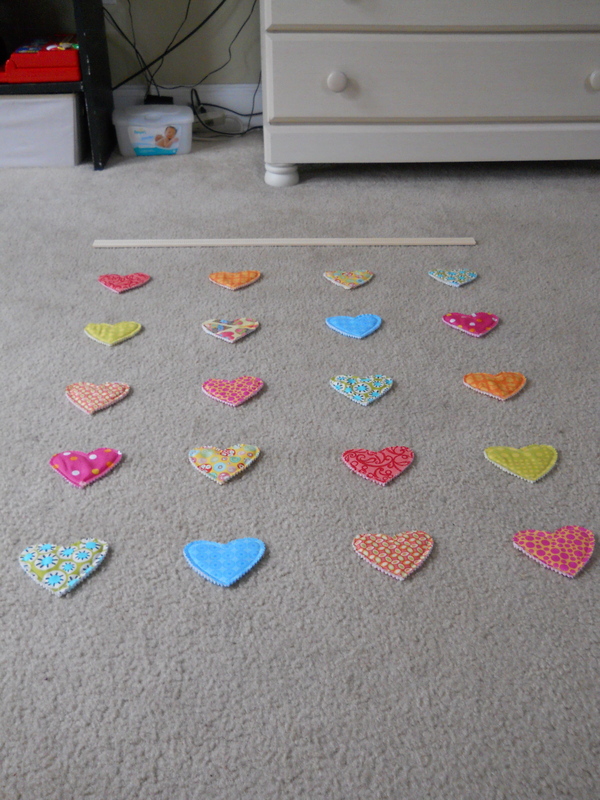 I made a stitch at the top and bottom of each heart (and pulling the thread through the middle of the heart so that it wouldn’t show) and measured approximately 4 inches between each heart. 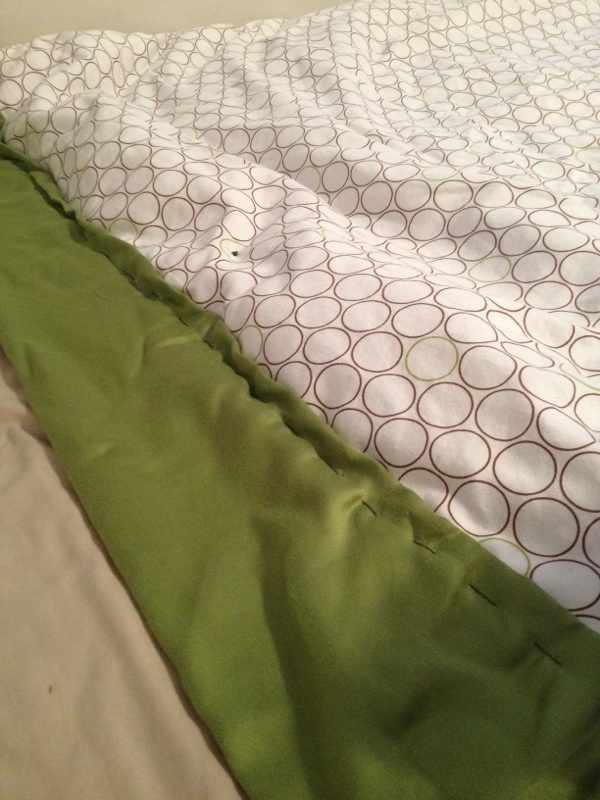 Last, I tied the thread around the trim piece and used command strips to attach it to the wall. 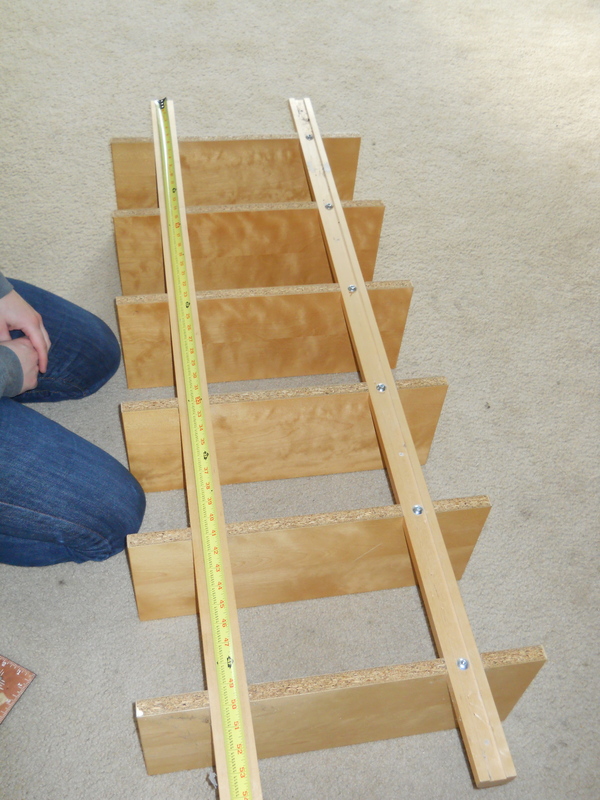 You can see the measurements weren’t perfect, but the beauty of homemade is that it doesn’t have to be perfect! 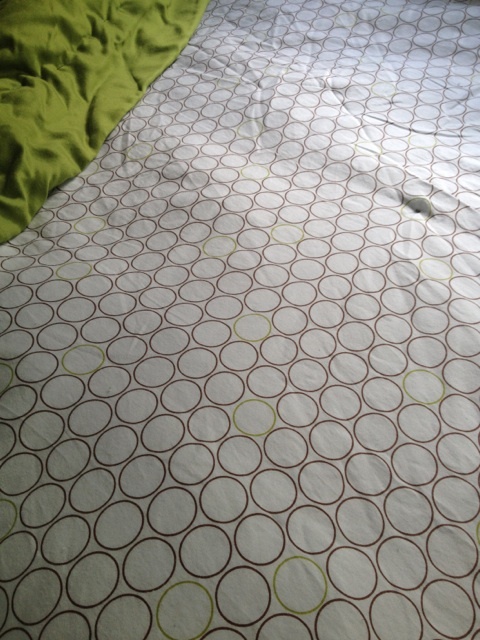 I opted for a different shape than the scalloped one (not even sure what it’s called). I made another paper template and cut out my traced scrap fabric. 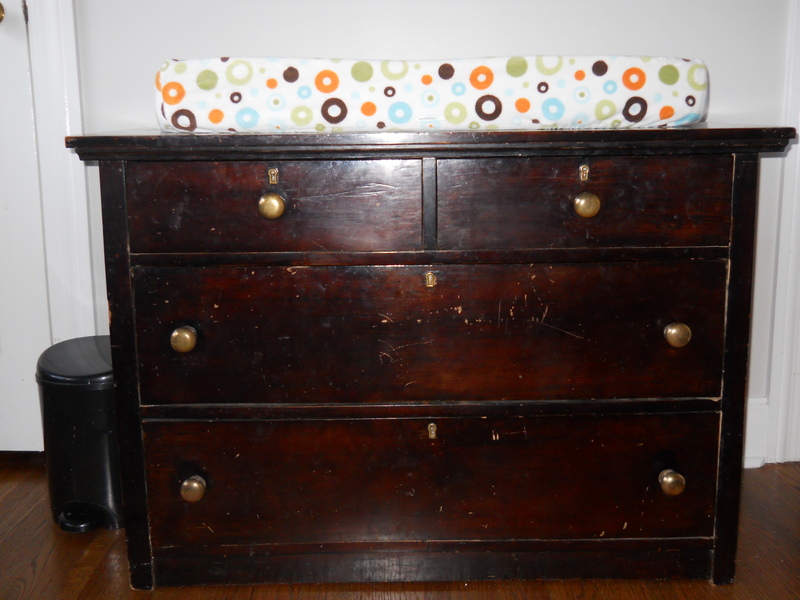 Then I bought some orange fabric binding (to tie in those cute little knobs on the armoire) and sewed it all together. 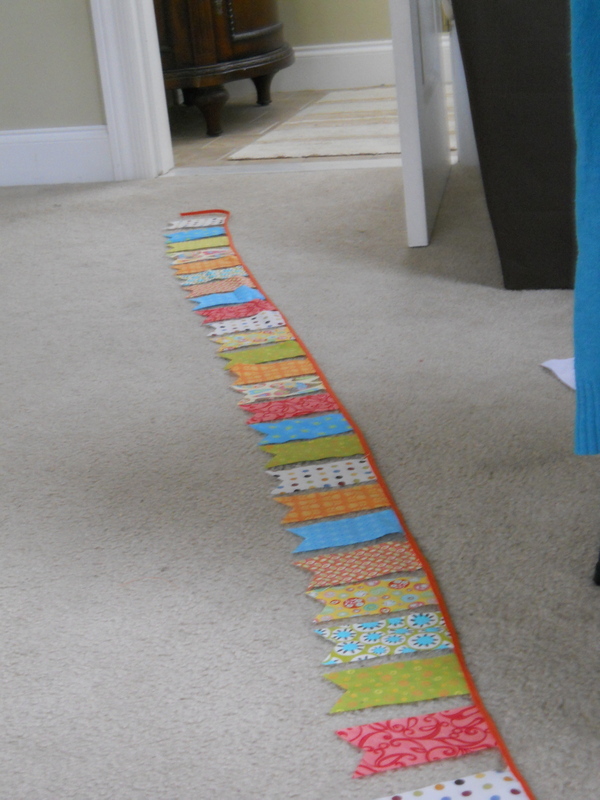 I had to go back and add a few more scraps until I reached my desired length. 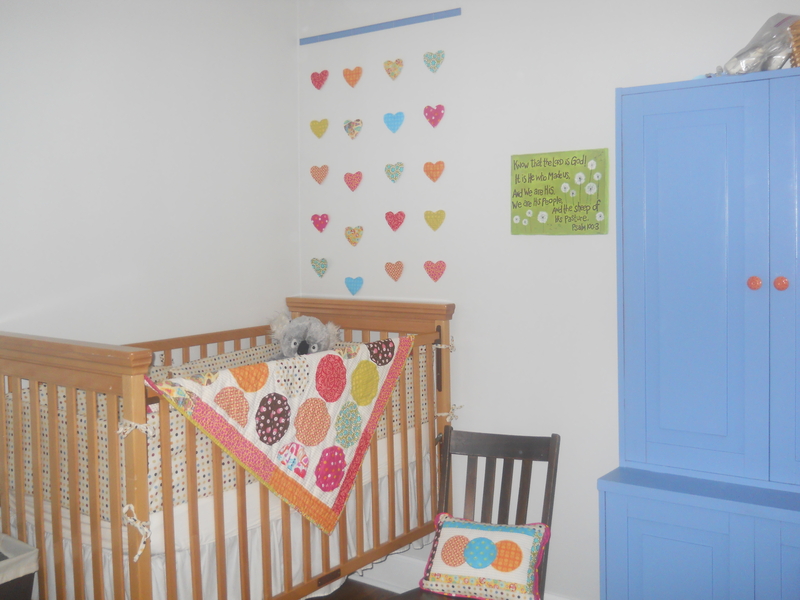 The really fun part is that all the of the fabrics used for the banner are a combination of ones Liam’s previous room/bedding and this baby’s heart wall hanging and quilt. 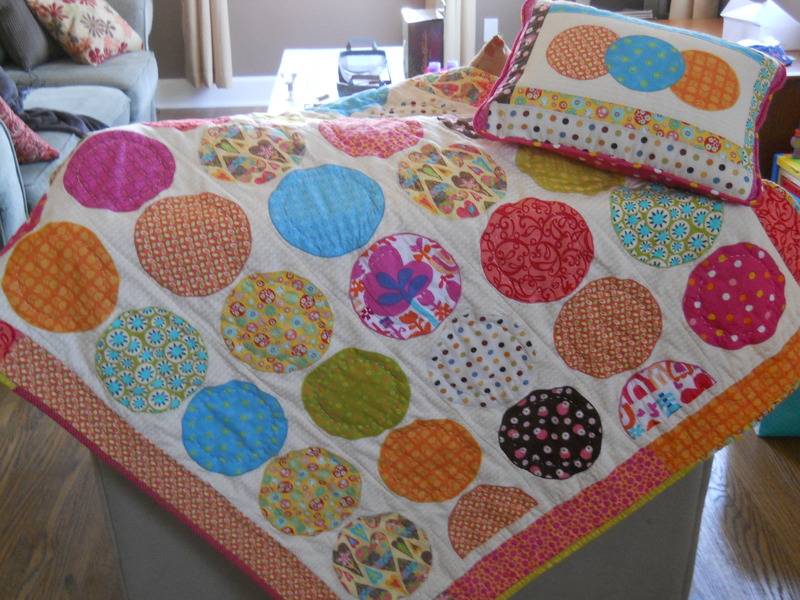 My mom made an absolutely precious quilt and little pillow for this little girl’s crib! She let me use scraps from that for both of my projects. 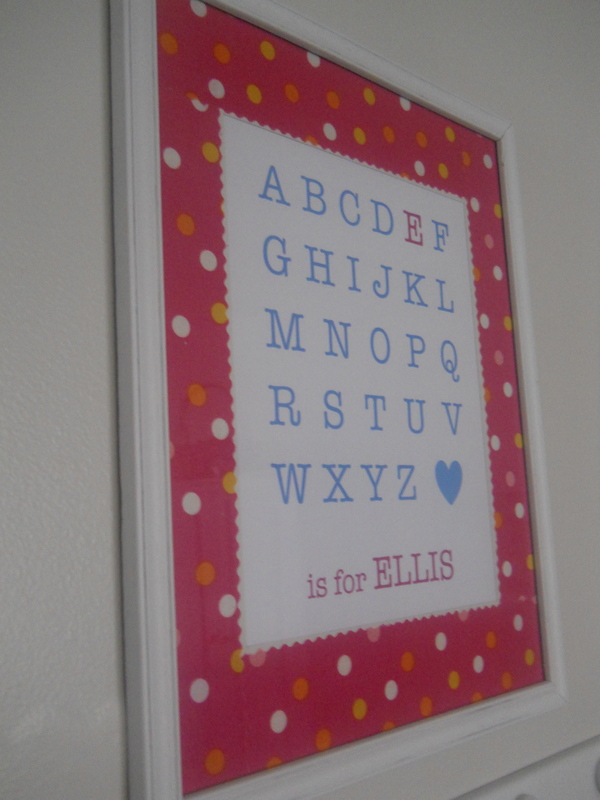 I think it’s the perfect way to blend the different colors and patterns for a little boy AND girl’s room! Remember how I mentioned all of the crazy projects (as in, multiple) we jumped into last weekend? 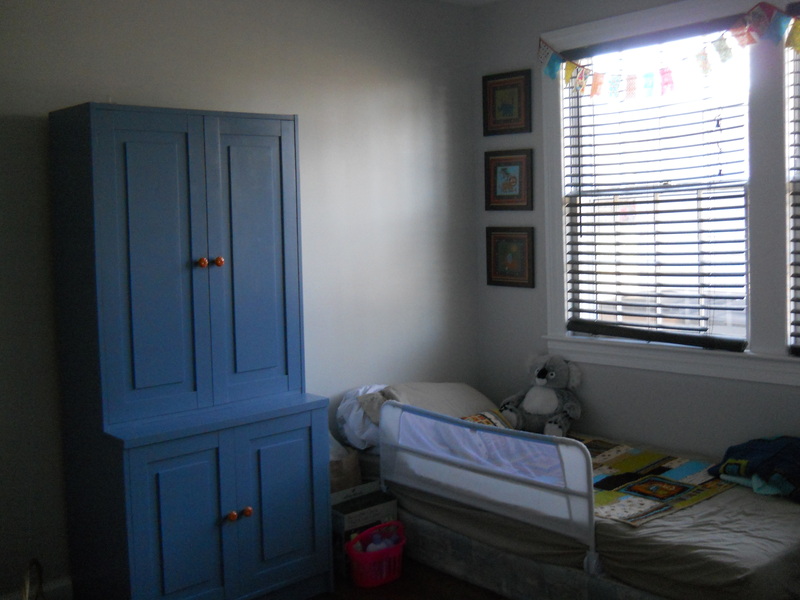 Well, here is part two of that day and phase three in the nursery transformation: painting the armoire. 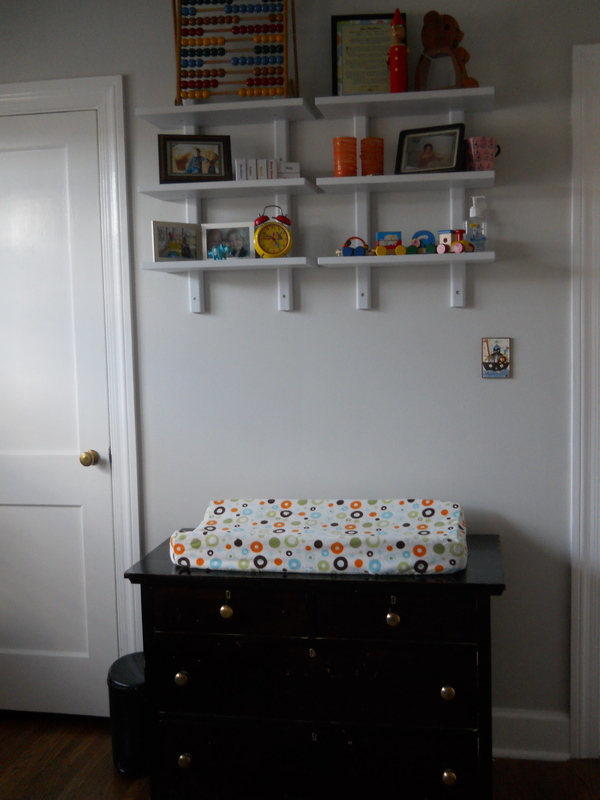 For obvious reasons (especially if you’ve seen the room in person), one of our chief concerns in this little makeover was to maximize storage. 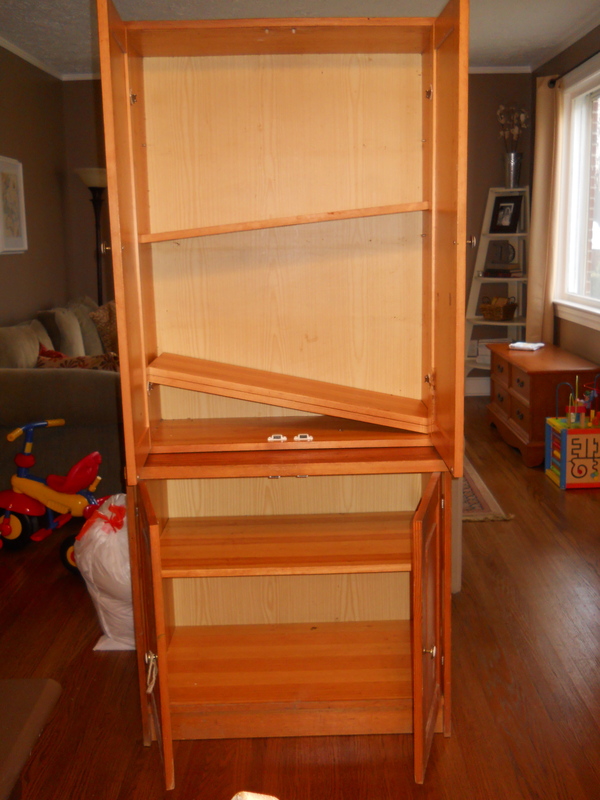 Every piece of furniture we brought in needed to be functional. 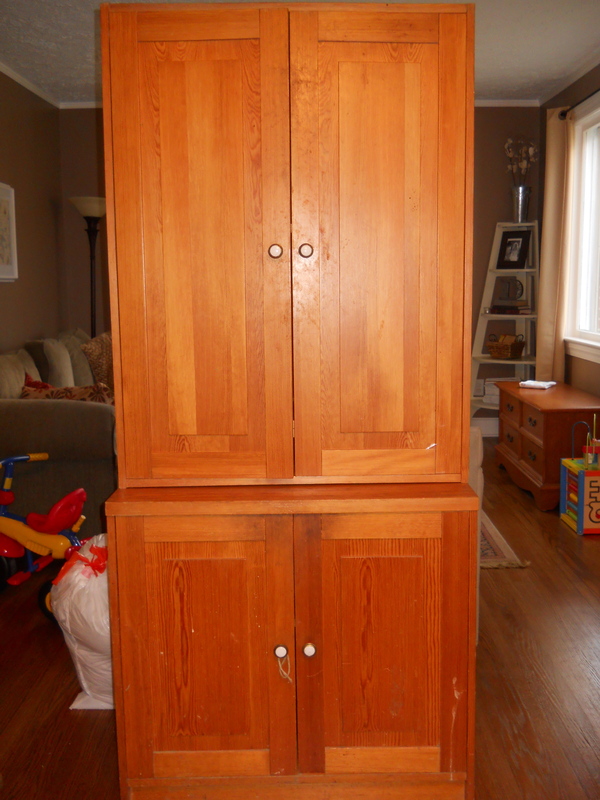 Back when we started talking about making a room for two, my in-laws graciously offered an armoire that they were no longer using. 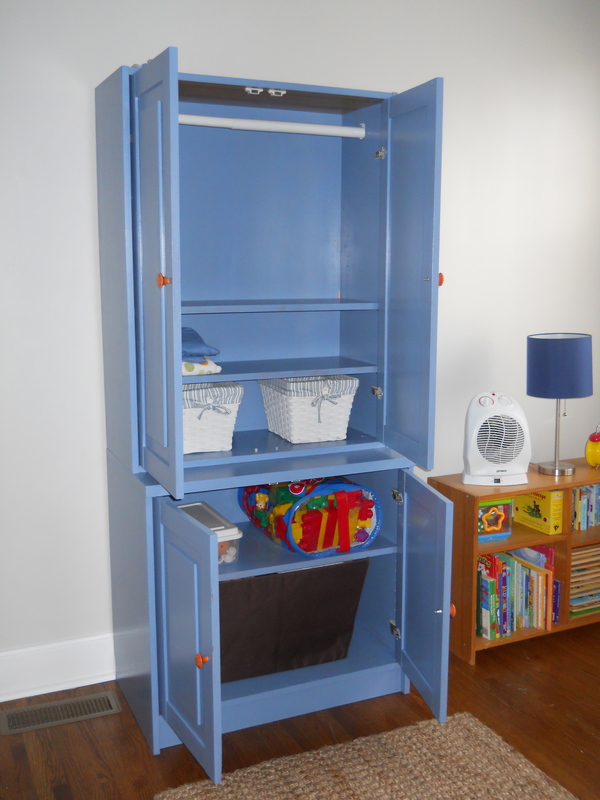 They’d had it since around the time Jonathan was born (and moved it across continents), most recently, though, it functioned as a pantry in their kitchen. So it’s kind of a fun piece of history for the room. The shelves were actually working (they just weren’t set up in this picture). 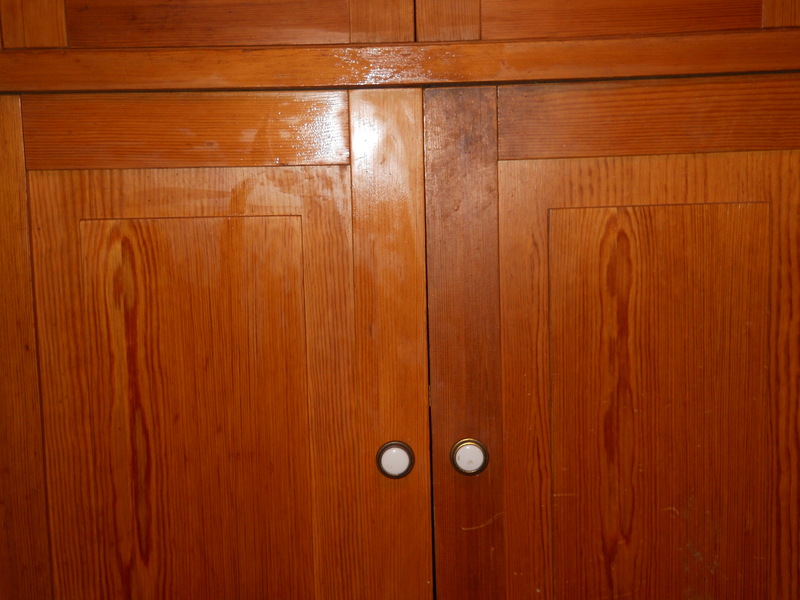 But, it had a hinge that needed adjusting and some wood glue for one of the door’s joints. Then, it was time to clean ‘er up! 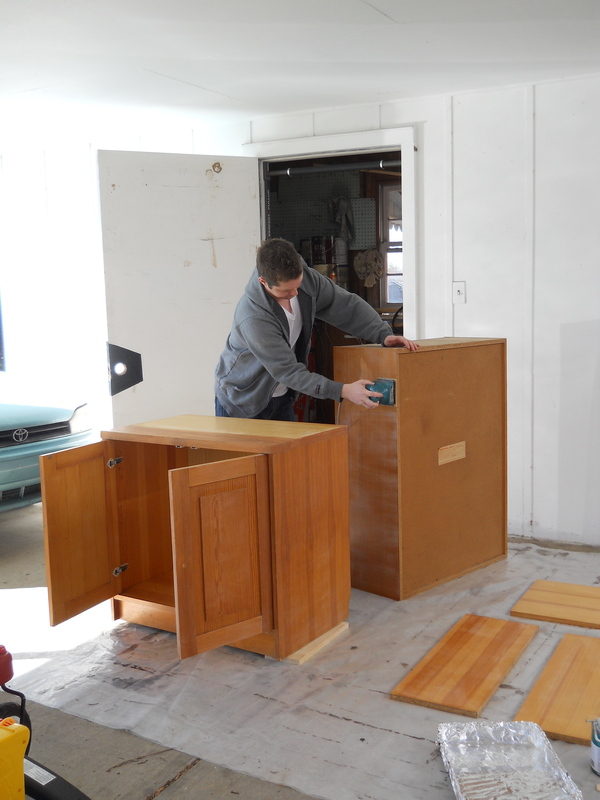 I found this great method for revitalizing wood furniture using a magic eraser and vinegar. It’s hard to capture on our camera, but you can see how much cleaner the door on the left is. Next up was a trip to Home Depot. 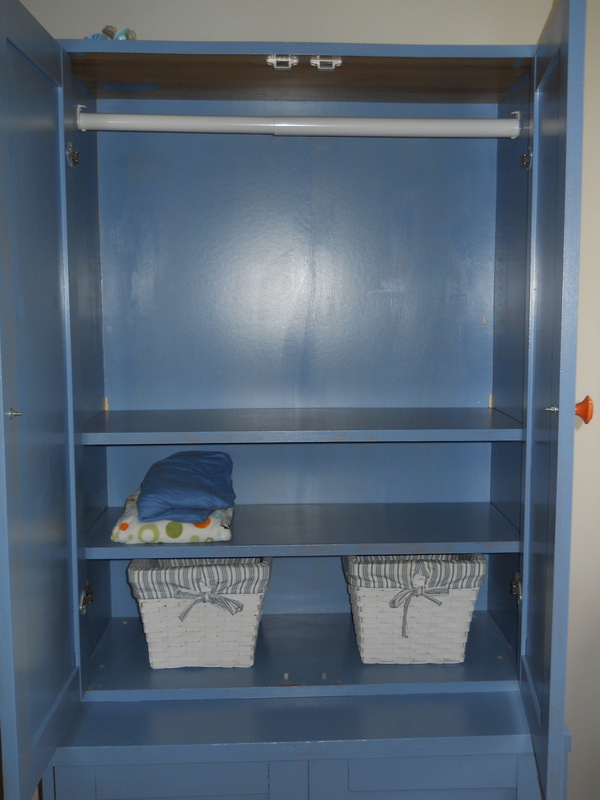 Our hope was to add some hanging space since Liam’s closet was just big enough for his stuff. 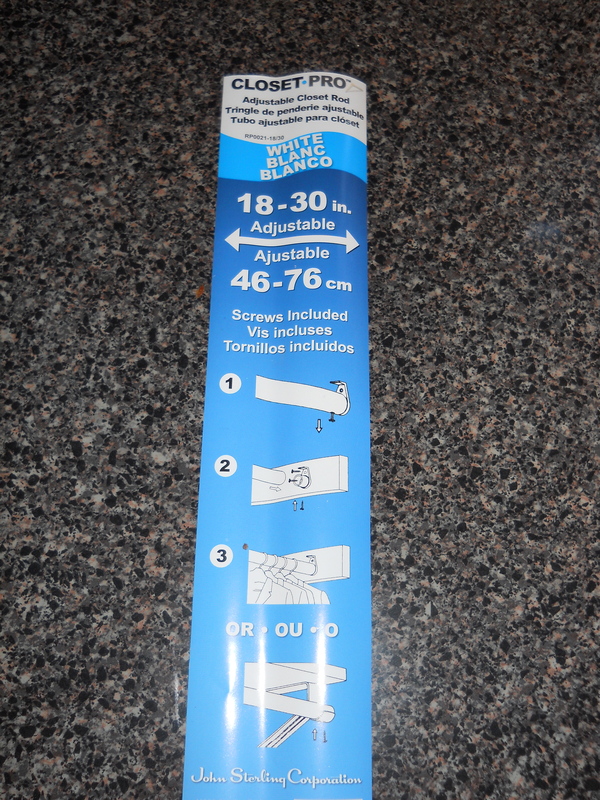 We bought a $6 kit to install a little rod for baby clothes. Here it is with the rod…simple enough. All that was left to do now was find a nice day to take it outside for some sanding and painting. Queue the weather last weekend! We’re having some problems with the left upper door sticking (which sanding hasn’t seemed to fix), so we have a little more work to do. 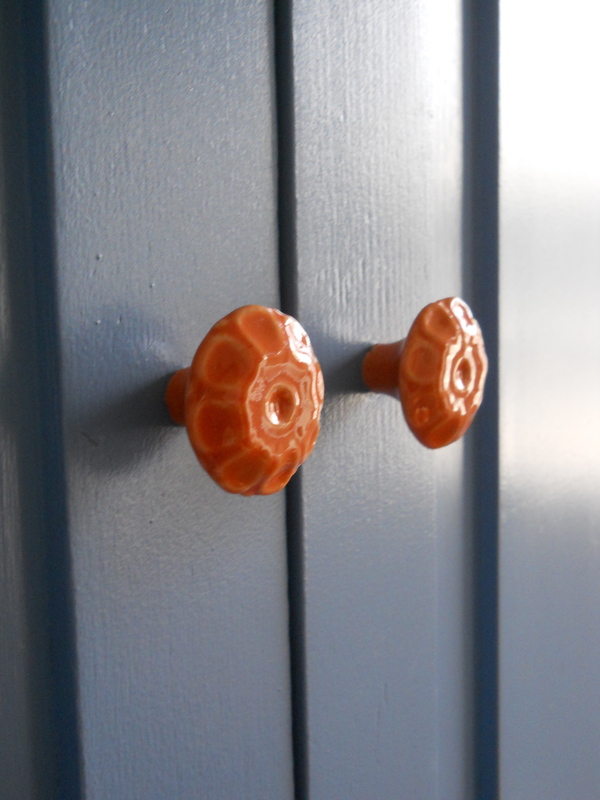 We picked out some cute little orange flower knobs at half price from Hobby Lobby. Aren’t they sweet? 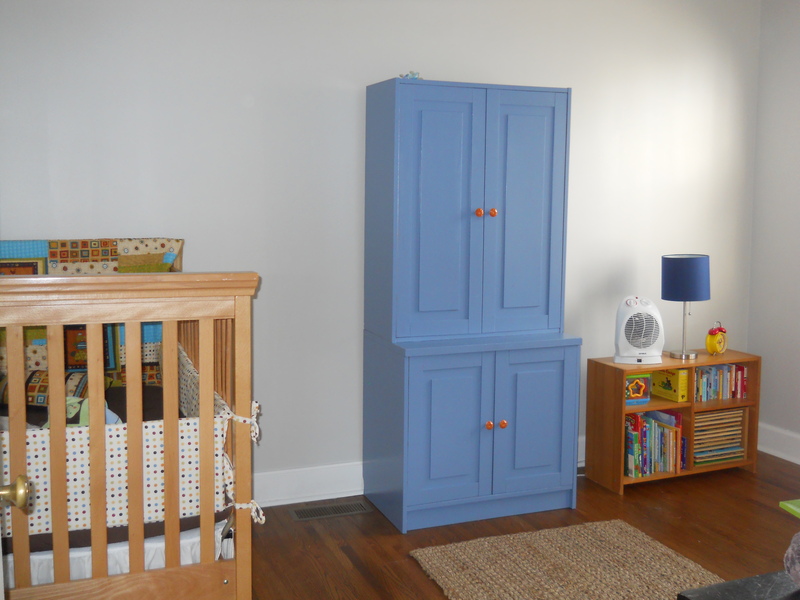 The plan is to put baby clothing on the top and have room for toy storage on the bottom. See? 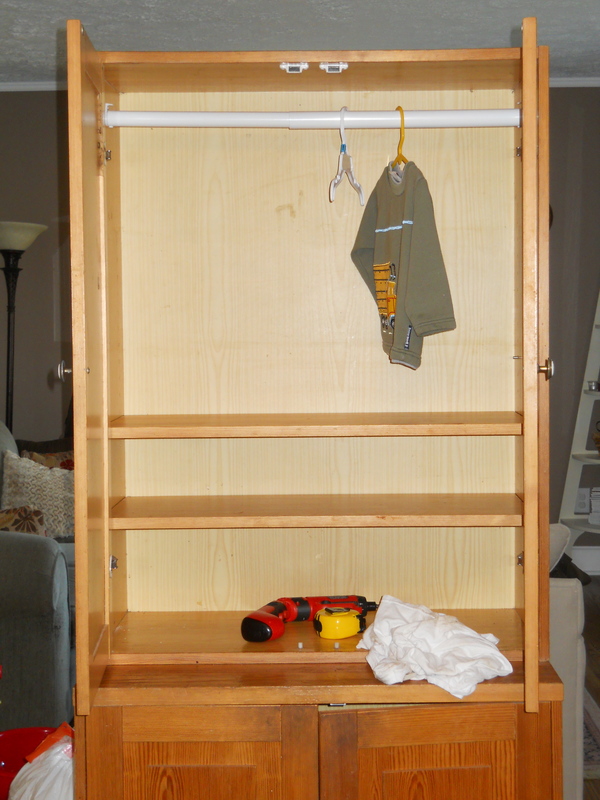 We’re making this armoire work hard for it’s space in the room! My biggest frustration is some of the scratch marks that chipped the paint of the interior when we placed the shelves back in. I have a feeling that the inside is not going to stay very pretty with the wear, but we decided that it was worth painting the inside for continuity’s sake. More projects are still to come! Well, this weekend has turned into a crazy how-many-projects-can-we-accomplish-in-a-short-amount-of-time weekend! I think the combination of nice weather, willing husband, and pregnant nesting energy is pretty effective! 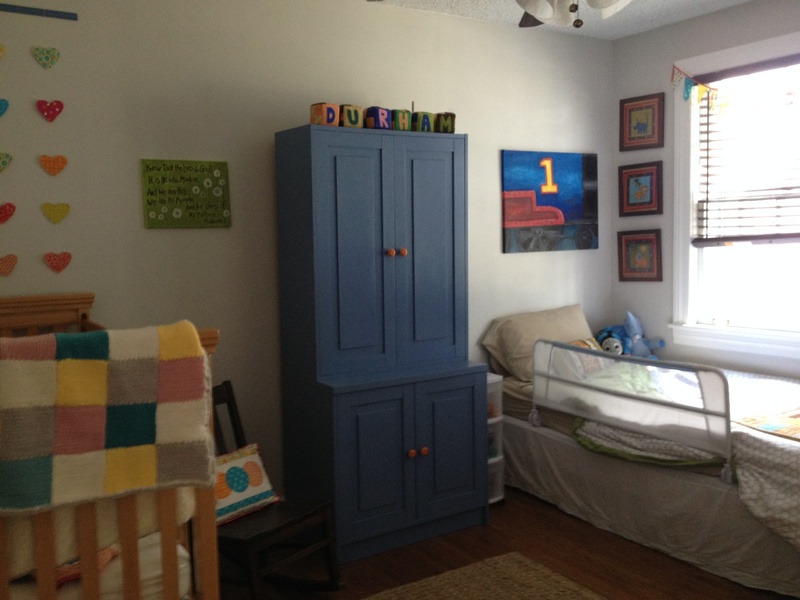 When we moved into our house a year and a half ago, Liam’s room (and the hallway) were the only things we didn’t paint. The whole house was painted a sandy tan with a slight pink hue. I wasn’t crazy about it then, but I didn’t have a specific color I wanted and we were already painting every other room. So, it stayed. I wanted a clean slate. It’s not that the previous color wasn’t neutral, but I just wasn’t really a fan. I wanted a more updated neutral: a light gray. After considering the room’s furniture, accent colors, trim color, hall rug, etc. 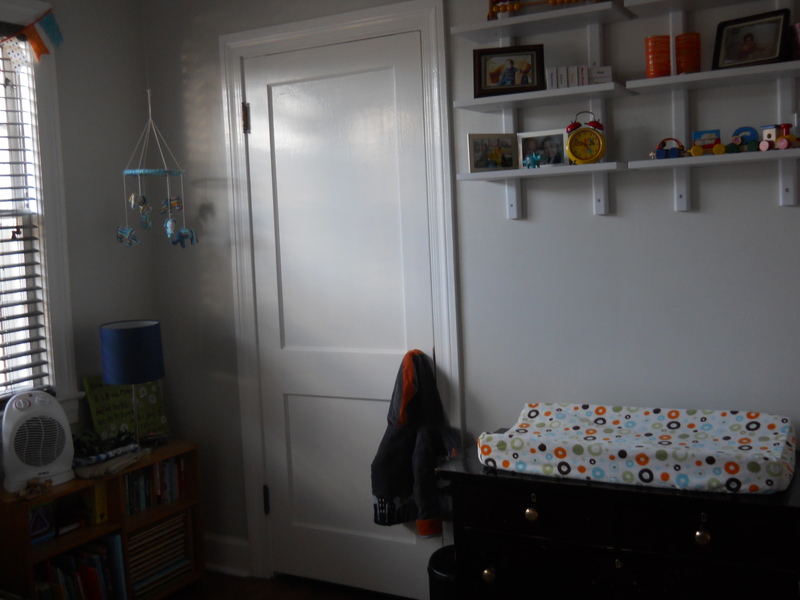 we settled on Behr’s Silver Drop. And we decided to paint the hallway, too, while we were at it. The time came when we had a Saturday free and the weather was nice (which couldn’t hurt! ), so we dove in head first. Some of Liam’s wonderful relatives, Uncle Buckle and Aunt Merrill helped us out TREMENDOUSLY by taking him to the park for a couple of hours. Now, for those of you worried for the health of myself and my baby girl, let me assure you that I researched the safety of pregnancy and painting. We bought water-based paint, had windows open and fans going at full speed for good ventilation, and I took frequent breaks outside to get fresh air. When we started, I was a little disappointed that it looked so white. But I was pleased to see it “gray” up to what we’d imagined as it dried. 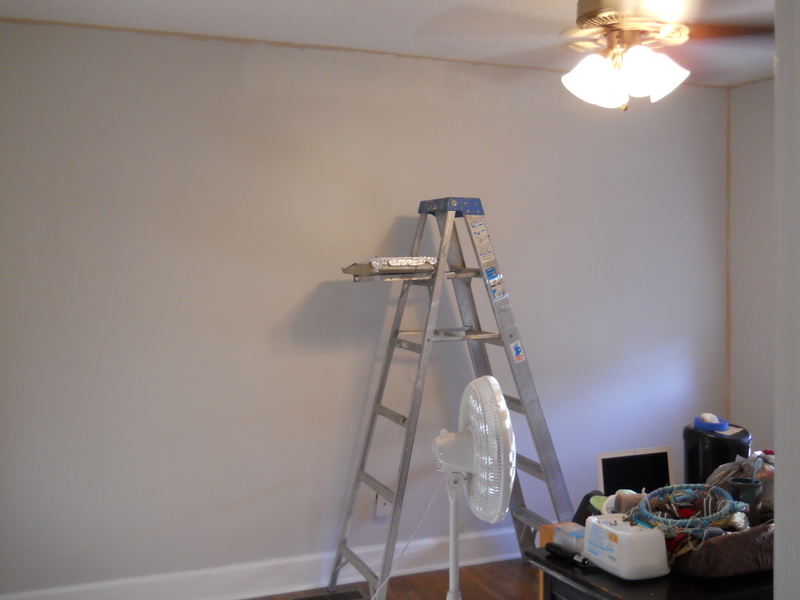 Also, Jonathan and I were a little nervous to do the painting alone, because we aren’t avid house painters. As it turns out, though, my husband is quite the cutter (much better than myself)! Who knew? It worked out well, too, because rolling took less time and I was able to spend less time in that part of the house. From start to finish, the job took us around 6 hours (we prepped and spackled the night before). 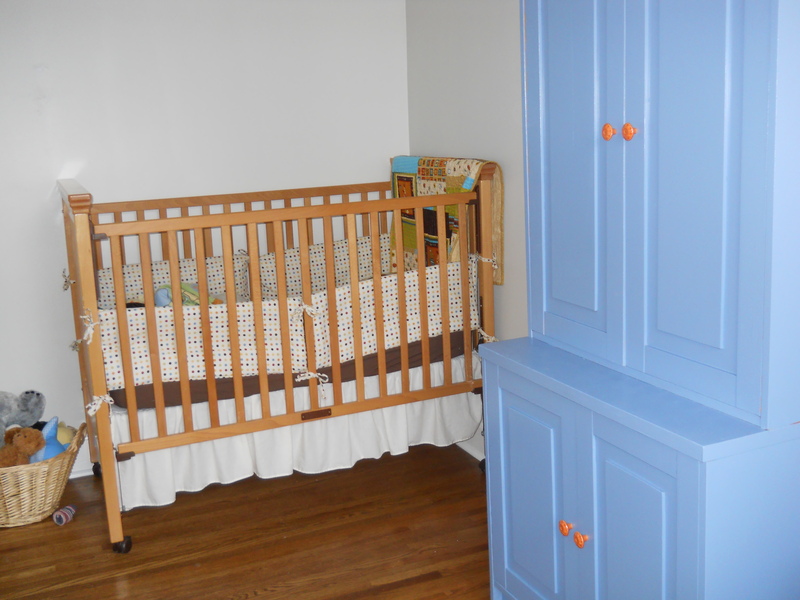 We moved Liam’s crib to our room for nap time that day, and had to remove the doors (and rehang them on either end of nap) to get it to fit through, but other than that, it was a pretty predictable project. 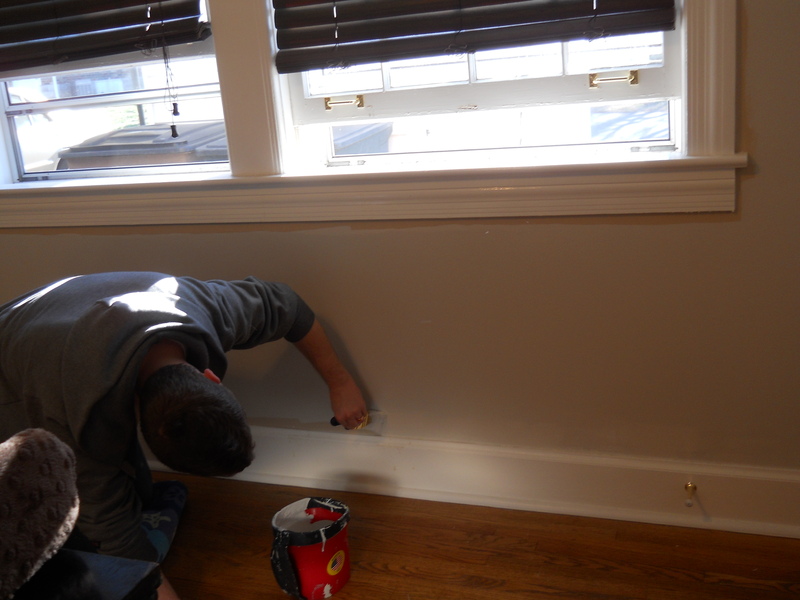 We ended up only doing one, thick, even coat and used the better part of a gallon (for both the bedroom and hallway). So far, I don’t think we regret it. The coverage looks nice and even to me. 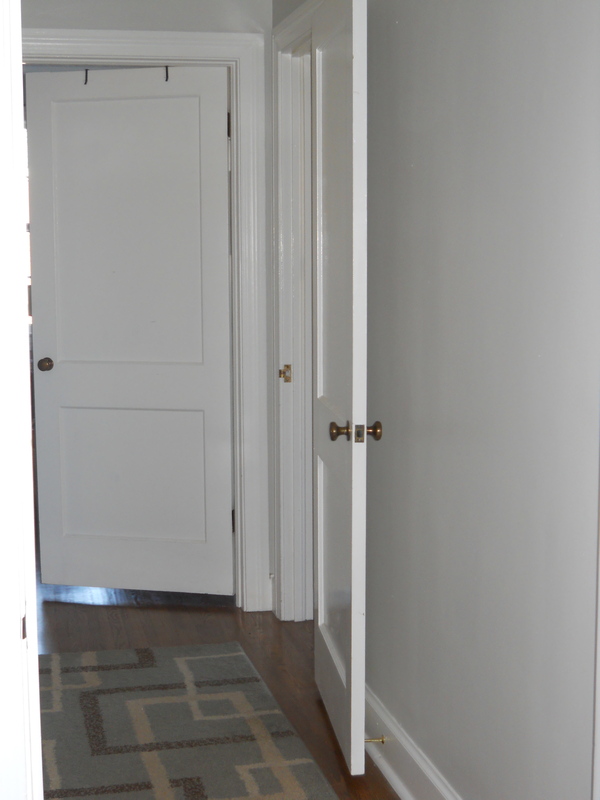 The hallway ended up being the harder of the two projects because of all the crazy nooks and crannies. We think it was worth it, though. It feels so much lighter and roomier. Ahh, I love it. We’re pretty stoked. Now, we just need to add furniture and stuff on the walls. Just be patient 😉 We’re getting there! One more thing, you know the nesting energy I was talking about? I wasn’t kidding. After we finished, I made a dinner of cajun honey butter pork tenderloin and green beans in the hour and a half before we went to a game night hosted by some friends of ours. I’m a little insane, I know. Alright, folks, the holidays have gone and the nesting urge has come! That’s right…it’s baby time! I have thought and fretted a lot about what direction to take things. And although I don’t have a crystal clear picture yet, my vision is coming together. (Thanks in part to Pinterest and their secret boards where I can post varying ideas privately). After much consideration, I opted to keep the bumper pads I made for Liam’s nursery. One of my goals is to minimize the amount of work I’m creating for myself. I wanted to soften up the bedding, though, and give it a more feminine touch, also freeing myself up to use some different colors as well. 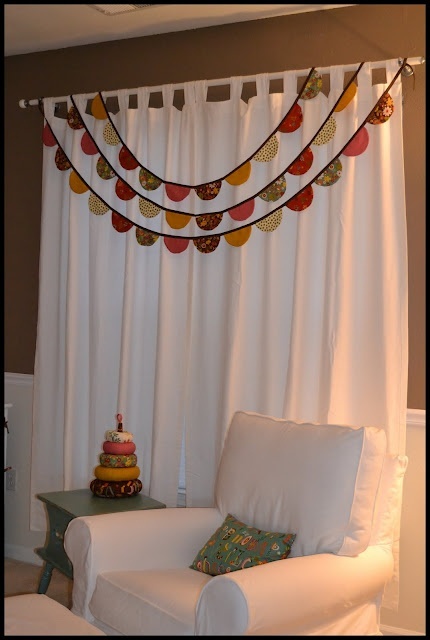 After discussing my thoughts with my mom, I decided that a plain, off-white dust ruffle (that matched the background of my polka dot bumper pads) would work best to keep things lighter and open up my color options for other things in the room. 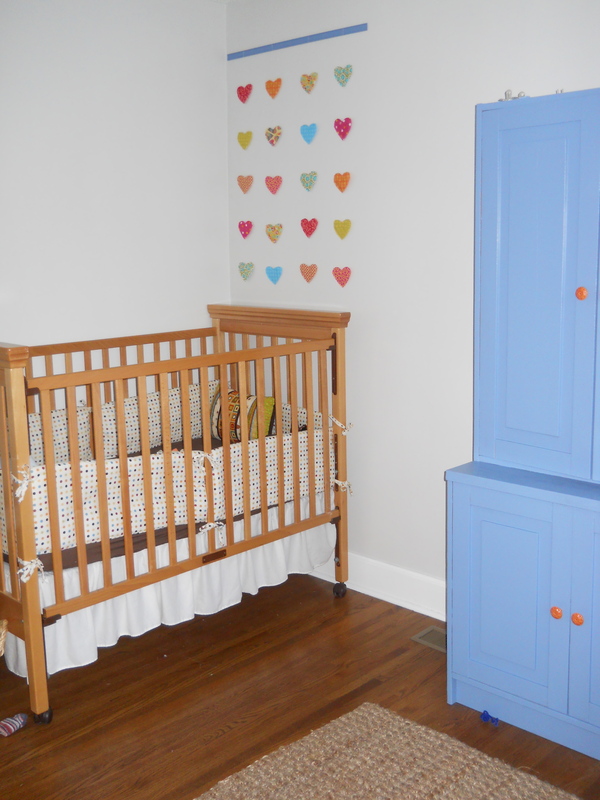 The trouble is, even “standard color” crib dust ruffles can be really hard to come by. I looked online and at Target and Kmart and had no luck (unless I wanted to spend $50-$100). How crazy is that? So, I checked a few Goodwill stores (without my usual toddler companion). I’ll admit, they don’t exactly make it easy to find stuff, but their prices can’t be beat. 🙂 I didn’t have any luck finding exactly what I was looking for, but I found a nice, simple, off-white dust ruffle for a twin bed and figured I could turn it into what I wanted. My mom, being the wonderful seamstress that she is, gave me step by step instructions, and I headed home with my $4.99 dust ruffle. 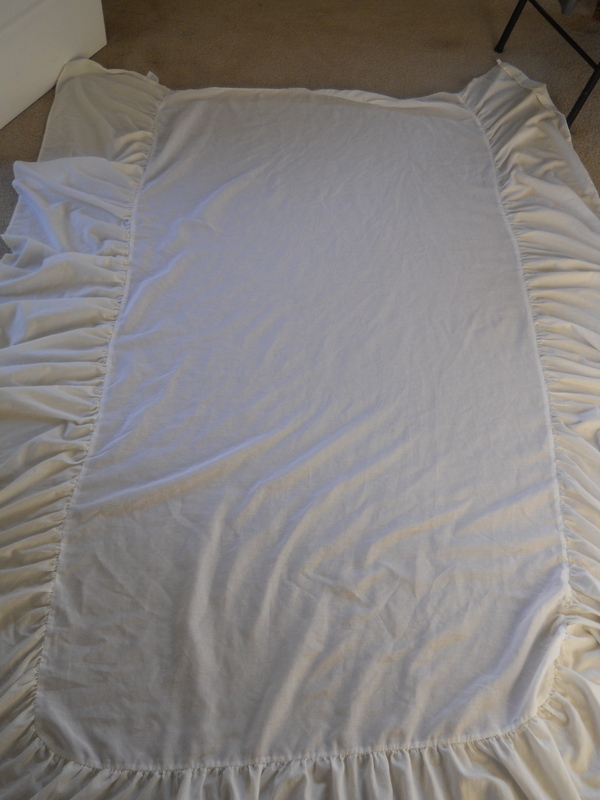 Next, I laid the old dust ruffle on top of the twin sized one, for measuring purposes. 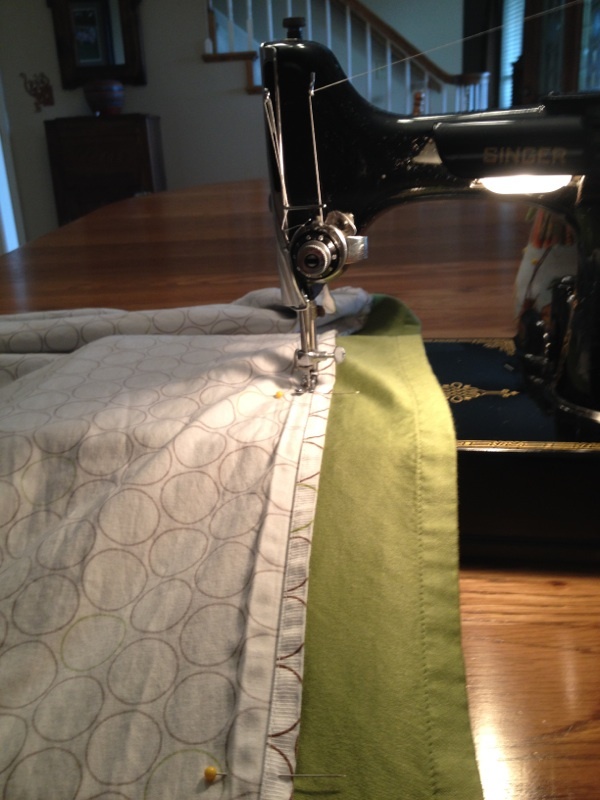 I folded one side over to the seam so that I could pin along the matching seams. 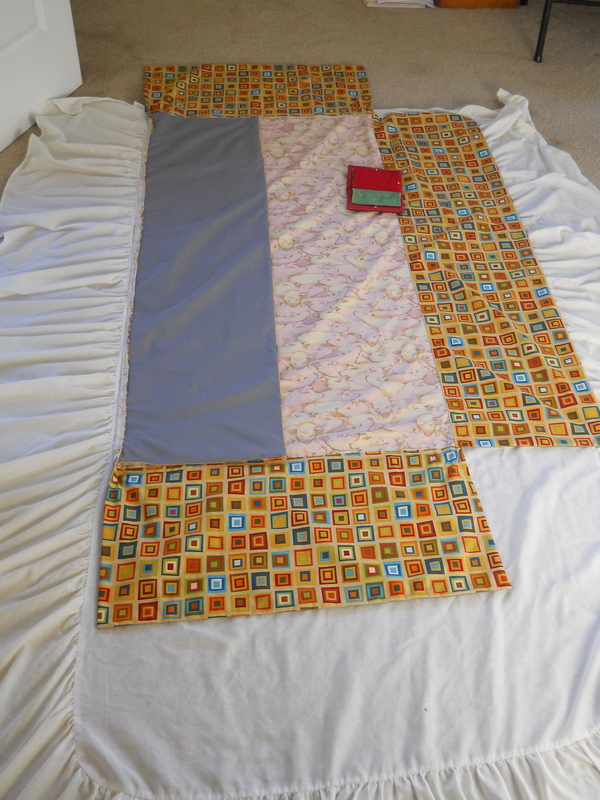 Next, I cut the fabric across the bottom and right sides, leaving the bottom fabric a 1/4-1/2″ bigger. 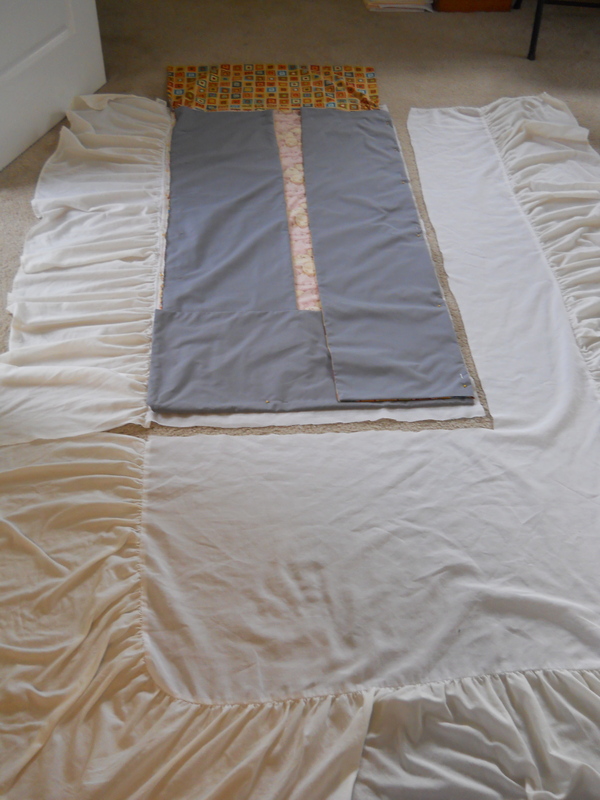 Then, I sewed them together, turning the thin, center fabric under slightly to that it couldn’t fray and fall apart. I also back stitched, of course, at either end. Now, I needed to create a finished edge for my corners. 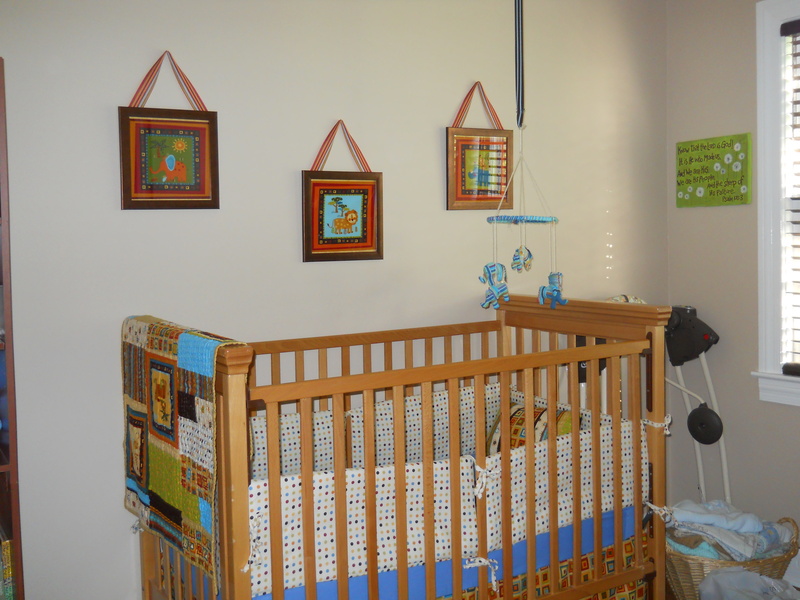 I actually didn’t want it all in one piece from the sides to the bottom because the crib’s metal framing would be in the way. 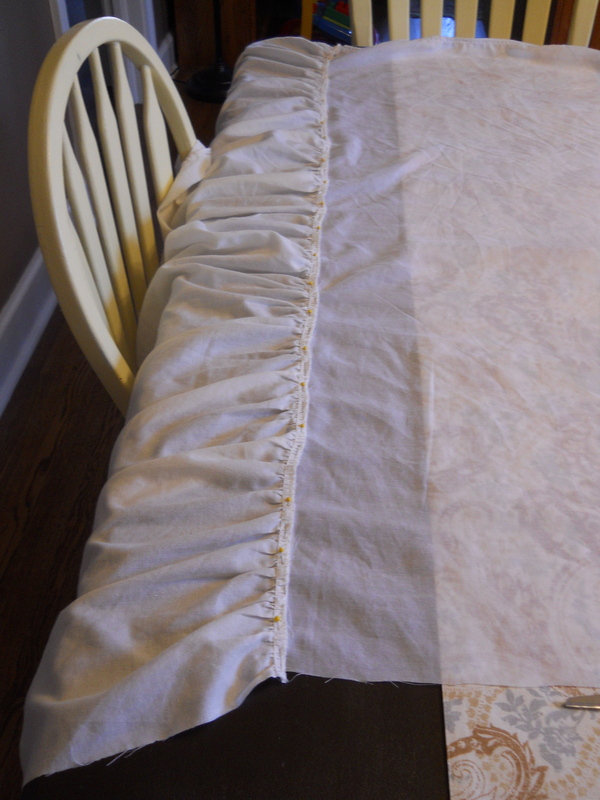 When I cut my ruffled edge, I left that fabric a little longer (maybe 1/4-1/2″) so that I would have room to fold it over without a gap. 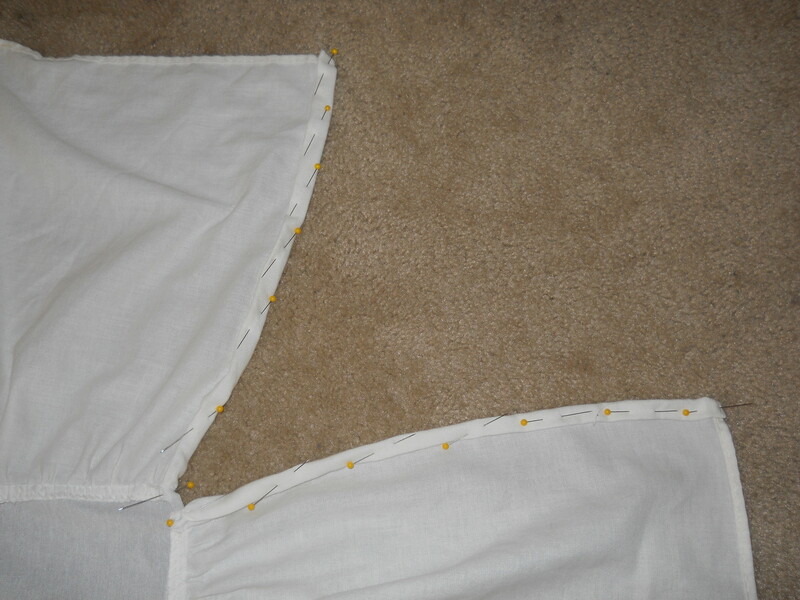 Also, it’s important to make sure you fold your seam under so that it will look finished when it’s right side up (i.e. how it will be on the crib). That was it! It was ready for its debut! Kinda sweet, I think. 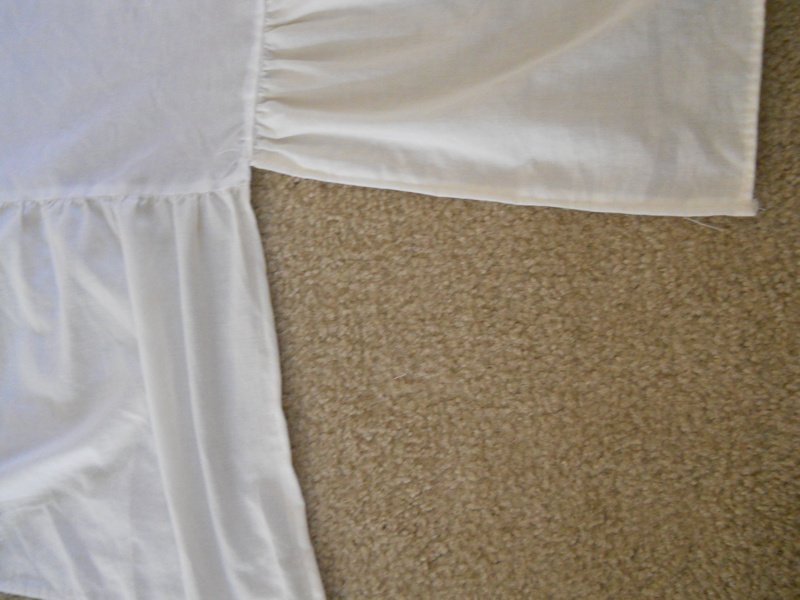 And a ruffly bed skirt feels more girly to me.